The first week of the NCAA Tournament (and NIVC) are in the books, as we move a little closer to crowning a National Champion. For now, here’s an updated top 25 power rankings based on what we just saw. After getting the top seed in the tournament, Stanford rolled through the first week – including against an LMU team that ousted them in 2015. They’ve got a Pac-12 showdown with Washington State, who they went 2-0 and 6-1 in sets against this season. The Golden Gophers quickly got through the opening weekend and are back in the regionals once again. They’ll look to get revenge on an earlier loss to Oregon while also pushing beyond the same round they lost in last season – to another Pac-12 foe. Illinois had a little trouble with Illinois, but overall they got through the first weekend in mostly impressive fashion. Now they’ll look to go a round further than they did last year as they get to host this time. The Cougars had some questions following an injury and a sweep loss to end the year to LMU. This week they didn’t lose a set and took down their rival for a second time as now they host the regionals. The Badgers are back to the Sweet 16 and the bracket has broken quite nicely for them. They could make the regional final without having to play a top 20 opponent as they dip back into the WCC. Nebraska got two sweeps, including over former Big 12 foe Missouri. Now they have maybe the tightest matchup of the Sweet 16 as they face a 2017 Elite Eight rematch with Kentucky. Penn State’s two sweeps push them to the regionals where their young core will have a Pac-12 heavy path to make the Final Four. That could potentially include a clash at #1 Stanford in the Elite Eight, who they fell to earlier in a tight sweep. Texas had two strong mid-majors in state and stomped out both of them as they continue to roll on. Now they’ve got a bit of a bracket break with Michigan moving on, but the Wolverines are still solid. The Wildcats have really been on a heater lately and that continued with a impressive showing in sweeping a strong Purdue bunch. Now comes the real test and if they can get revenge on Nebraska and reach another Regional Final. The Ducks were tested by New Mexico State and then almost stumbled against Baylor, but at the end of the day they survived and advance (cliche ding!). They’ll now look to recapture the match they put together against Minnesota the first time. Washington State had one of the toughest second round matches in facing Tennessee, but got by it in four. Now they’ll look to shock the world as they get Stanford for a third time this season. Washington had a big rut in the season, turned it around, then lost twice to finish the regular season – but against Oregon and Washington State close. Now they’ve peaked at the right time and won on the road against a good Creighton squad to reverse what happened to them last season. The Bluejays suffered the same fate they did in 2017 – hosting as the 9-seed and falling in the second round. Things are tougher when you have a target on your back, as Creighton is finding out. That said, it’s been a great season for the Bluejays overall. Michigan had to dig deep to upend Pittsburgh, but they found a way to get it done in giving the Panthers their first home loss of the season. The Wolverines will now look to continue their Cinderella path past Texas. The Panthers put together an unbelievable season, winning 30 matches, dominating the ACC and earning a top 12 seed for the tournament. But that one-loss elimination tournament can be so cruel at times, as it was for Pitt, who had their first home loss in five to Michigan to end the year. USC looked good in getting past Samford, but then were surprisingly swept at home to a 12-loss San Diego team. It’s been a bit of an inconsistent year for USC, so this was seemingly a thematic end, though it’s still disappointing nonetheless. Purdue swept a really good ETSU team that had beaten Washington State and some others, but then couldn’t muster up enough to match Kentucky. Still, considering all of the new faces, this was a successful year for Purdue. The Lady Vols were one team who didn’t have the RPI to host, but were close to that level of play. They beat a strong CSU team and challenged Washington State. They finished ahead of Florida in the SEC and swept them head-to-head, so they finish the year in the top 20. The Gators are back in the Sweet 16, and now have a real chance to pull off a huge upset with their size and blocking. The reason they drop to 19 is that a few teams below them had stronger opening weekends and second round wins, while Florida’s bracket opened up and Tennessee owns the tiebreaker in front of them. Marquette had high expectations coming into the season, and although they couldn’t attain the goal of a Big East title, making the Sweet 16 is pretty special. Now they’re playing with house money as they try to upend Illinois. 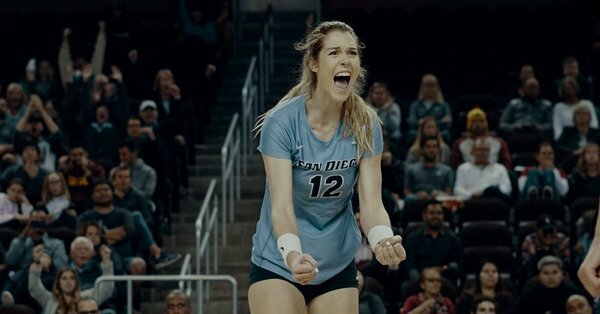 The Toreros have turned into the underdog story of the tournament. They barely got in at 16-12 – although had some nice wins over Baylor, Tennessee and in the WCC. Kaity Edwards either being healthier or fighting through it helped win against USC too, which makes them a different team as they make a huge jump. The Bears had some injuries throughout the year, but they finished strong and almost fought past Oregon into the Sweet 16. They end the year in the top 25 once again, as they’ve established a consistent program and will look to make the next jump in 2019. It’s really unfortunate that Cal Poly was without Torrey Van Winden due to injury. For all we know, had she been good to play they could have been the team to upend USC. As it stands, it was still another great season overall for the Mustangs. Missouri advanced to the second round yet again by sweeping Arizona, but couldn’t handle Nebraska on the road. They should be a set up for a strong 2019 now too. The tournament is very fickle. UCF had beaten FGCU twice earlier this year (6-1 in sets). All of the sudden, maybe with some added pressure, they fell in five and you’re season is over. It doesn’t take away how good of a year it was for UCF though and they wind up #25.